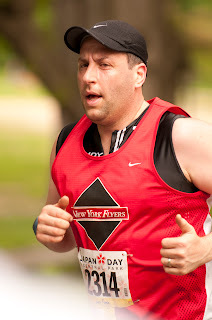 Looking at my race pictures from today's 4 miler, I found myself being hypercritical about myself (critiquing my running form, the existence of a double chin, you name it). I figured it would be interesting to take a step back, and compare where I am today to where I was when I started running. 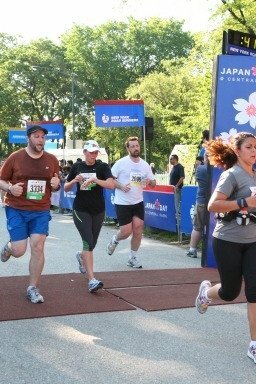 This first picture is from Japan Day 2008, my 3rd NYRR race ever. This was a huge milestone for me, because it was the first race where I broke 40 minutes in the 4 miler. Obviously, I was carrying around a few extra lbs back then, and was still finding my way as a runner. Fast forward to 2012: I've lost around 50 lbs, and for the most part, have kept it off. I still have more to do, but I'm happy with the progress I've made. 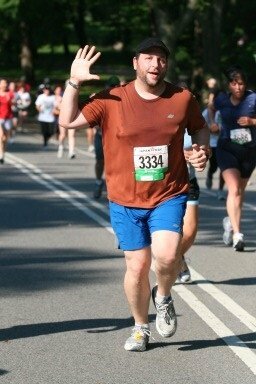 I've run numerous half marathons, 5 marathons, a Tough Mudder and am in training for my first two triathlons. This is me, fighting my way to a 30:36 finish, which represents a 40 second improvement over my last 4 miler (last month), a 1 minute and 20 second improvement over my first 4 miler of the season, and a 9 minute improvement over that milestone race from 2008. I have to remind myself that the continual pursuit of the best that you have to offer is what keeps me doing this, and that my life is drastically different now than I had ever imagined it being before I became a runner. I have made so many amazing connections with incredible people, whether they are teammates at PRSFit, NY Flyers, JRunners, the Rogue Runner Posse, or just people I have come to know from Twitter and Facebook. A big part of my success is due to the support, encouragement and camaraderie I get from these people. For that, I can't thank you enough. This season just continues to amaze me, and I can wait for what's still to come! What a great way to see the positive. Joe, it's been great seeing your improvement through your tweets over the years. Isn't running AWESOME? What a wonderful post. Congratulations on all you've achieved over the past four years. You're an inspiration to many people, my friend! Joe, man, this is so cool! You went from a beginner to someone who not only looks like an intimidating running force (Flyers pic) but is physically as well! Keep going!